Now that hundreds of agencies and arm’s length bodies are moving to GOV.UK, it’s time to revisit this list, and make sure it reflects the diversity of what they all publish. It’s also a chance to fix known problems with the existing types, eg the ‘policy papers’ type is too restrictive, and detailed guides don’t appear under ‘guidance’ in the publications filter. As part of this, we’ll be adding some specialist document types, where there is a need for users to find a complete list of documents of the same type and be able to search it. An example might be Environment Agency permit notices or VAT notices. We’ll be starting with a small list of these, but will add more where there is a need. All publications and detailed guides will be labelled by type to reassure users they've found the right thing eg a VAT notice or white paper and inform them if it has a special status, eg national statistics. Where a document has been tagged as a specialist type, that's what we'll display - eg an Environment agency permit notice will be labelled as such, rather than as a notice. On the publications filter page, users will select from the list of main document types, but specialist types will be returned in the filtered results when any relevant main document types are selected (eg VAT Notices will be listed if you choose either Guidance or Notices as the main type). This is because the specialist types are much narrower in scope and most of the filter options (organisation, policy, topic) won't be relevant. We’ll keep an eye on how this performs, but it’s supported by the analytics we have on how people are using the publication filter at the moment: only a tiny percentage of users select anything more specific than guidance, statistics, forms or consultations. Here’s our first draft of the new types. We’d really like some feedback on it, please. If you're interested in tax, also take a look at a more detailed post about possible HMRC specialist document types. Thanks Alice. This looks good. Firstly, it looks like you've changed the current document type "Research and analysis" to simply "Research". Our researchers will be pleased with this as they tell us research and analysis are very different things. However, there's no publication type for analysis. Is this deliberate? I think that our researchers may be asking us if this an analysis category could be set up. Secondly, you have set up sub-categories for some transparency releases, but not others. We also publish transparency releases about staff numbers and costs, performance pay, business plan measures among other things. Would these just be listed under general transparency? Thanks for your feedback, Keith. We could have analysis as a separate type - I'd be interested to hear from others if this is a widespread need. I agree with you on the transparency releases where some have specific sub-types. We should be consistent, and there are so many that it's probably best just to have a single transparency type. Hi Alice. Some good ideas here. Have you listed the most popular publication types first? In the "FOI and transparency" list, perhaps FOI should be the first item (or change the heading to "Transparency and FOI"). If users (like me) aren't sure what "Strategy" means or what a white paper is, can they select a main item like "Policy and bills"? Good to see case studies included at last! Hi Michael, thanks for your comments. Yes, the main item can be selected in each case, e.g. policy and bills or guidance. When we implement the new list, they will be in order of most popular publication types, but they aren't yet grouped like this. So FOI would come first in this list. There's a whole section for consultations. I’ve never really understood why these are also included under ‘publications’. 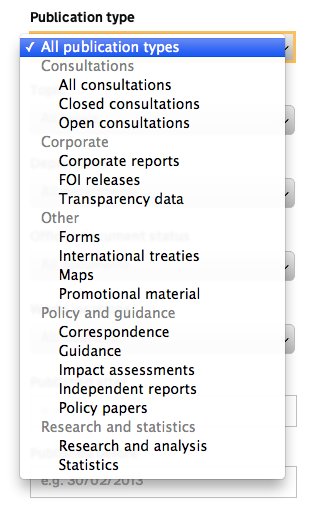 Seems odd that on department pages you can ‘see all consultations’ and ‘see all publications’, but publications also includes those in the consultations filter. Personally, I think consultations should be removed from 'publications' (but realise other users may want it that way). Announcements have a separate section like consultations but aren’t included in documents? Will customers be able to tick several types of publications (is this what they want)? With the more granular level of detail, if people aren’t sure if they want ‘guidance’ or ‘detailed guide’ would they need to do separate queries? Could the list of types become over-whelming? Great stuff. Have you considered if the news item ‘fatality notice’ should also be included under ‘notices’? I realise it is currently a type of press announcement, but could people expect to find them in the new ‘notice’ publication type? You suggested organisation-specific notices would be labelled for that organisation. But could that become too many for customers? For example, if the acronyms in ‘OSA decisions’ and ‘NCTL decisions’ are organisations, would it be more flexible for the user to have one type of ‘decisions’ and then choose which organisation they want under the organisation filter? (This could be pre-defined from each organisations home page so people only see Environment Agency notices?). I’ve seen inconsistency in how published newsletters and bulletins are tagged. My interpretation of the style guide is they should be ‘correspondence’ but they are often under ‘guidance’ which feels wrong. Is there a need for a specific ‘newsletter’ type? I do wonder, though, whether newsletters need to be placed on GOV.UK at all – aren’t the people who want the newsletter getting it direct? Perhaps GOV.UK email alerts could be further refined to avoid the need for separate newsletters completely in some cases? My organisation produces a lot of plans and reports on work we have to do, like improving water quality or managing flood risk or drought in a location. We’re about to move them to GOV.UK and expect to place these under the current ‘policy papers’ type, but do you think other organisations might have to do something similar (e.g. Highways Agency feasibility reports for road improvements – if they do such a thing?) and perhaps a new report format is needed? I don’t think ‘annual report’ and ‘business plan’ fit (they seem more about the organisation performance, but we could use 'business plan' if you agree as that seems more applicable than 'policy paper'? ), nor research. Happy to discuss direct or via our transition manager. When you do expect to introduce the new types? Will this be several over time or all the new types at once? What are the expectations on re-tagging existing publications? Are there any tools to help, such as an export of the current data in a spreadsheet, alter the document type and import back in GOV.UK in bulk? We're transferring our publications now but looks like we will miss out on the new document types to tag to. Consultations - I agree that it's a bit contradictory to see them appearing under both headings - we are currently reviewing the overall design of this top navigation bar and intend to make some improvements. I wouldn't want to remove consultations from publications index at the moment though since we know people are looking for them there. Publication types - We are testing a multi-select design with users at the moment. Although specifically on detailed guides, we will cease to use this name and users will just select 'guidance' to get detailed guides and guidance publications. Notices - yes we should look at fatality notices. Organisation named notices - where notices etc correspond directly to agencies it may be unnecessary for them to have a subtype and we will review these. For other types, e.g. VAT notices, this will not be the case. Newsletters - in general these should be tagged as correspondence, but sometimes they are the only published version of government guidance and so we have allowed them to be tagged as guidance. Newsletters shouldn't be published on GOV.UK unless there is a user need for it. Timing - we are creating the new types 'Notice' and 'Decision' this sprint (two weeks), but the more fundamental changes will take place over the coming months. Re-tagging - we will automatically migrate all publications where there are one-to-one mappings for categories. Otherwise we'll be expecting editors to retag. I agree that there are too many sub-types of transparency content to list them all, so should just keep one type as now. The 'Research' sub-category should remain as 'Research and Analysis' as they are different things (Research is looking for facts/evidence about something. Analysis is thinking about the facts/evidence and deciding what they mean.) If 'Analysis' had its own sub-category, many people wouldn't know the difference and might categorise them incorrectly. Annual reports and business plans should not be split as BIS often combines the two, and we'd have to do a lot of cross referencing. What would go in the 'Strategy' sub-category, it seems too ambiguous and might cause wrong classifications. Having browsed through your list of publication categories above, I noticed several of the "Less common type" categories currently available have not been included, specifically "International Treaty". Due to the nature of the work that we deal with, the "International treaty" category has been applied to a number of reports which we have published. Following a recent discussion with a content owner, it was felt that this was the most suitable category available and that none of the others applied to the treaties that we had published. Ideally, we would like this category to remain available, but if it is not to be kept, what would International treaties then be applied to? Hi Martin - it sounds like there is a need to keep International Treaty, so we can add this to the list. Any news on when the changes to publication types might happen? We've just been told on this blog https://insidegovuk.blog.gov.uk/2014/07/24/statistics-announcements-on-gov-uk-what-this-means-for-publishers to change all the publications currently tagged as 'statistics' to something else by the end of August 2014... I'd rather not do re-categorization twice.